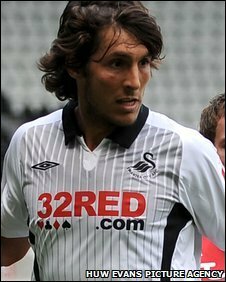 Midfielder or striker Guillem Bauza has been released by Swansea City. The 25-year-old Spaniard was signed by former manager Roberto Martinez on a free transfer from Espanyol in June 2007 on an initial one-year contract. Bauza earned an two-year deal the following season as Swansea finished as League One champions - he scored the goals that clinched promotion. Bauza follows Marcos Painter out of the Liberty Stadium after the defender joined Brighton and Hove Albion. Youngsters James Burgin, Daniel Sheehan and Kieran Howard have also been released. Manager Paulo Sousa is in the process of trimming his squad for next season's Championship campaign, having just missed out on the play-offs this term. "As a manager you always have tough decisions to make,'' Sousa told the Swansea City website. "Bussy [Bauza] has played an important part in the club's recent rise and I'm sure everyone would like to thank him for his efforts." Ankle and knee injuries limited Bauza to just three league starts this season and three from the bench, plus a further substitute appearance in the League Cup.